STOP PRESS! Not a proper post, but I know lots of you have an interest in folk music and traditional dance, and I'd hate you to miss this! Earlier this year the Ouse Washes Mollies took part inthe Ramsay Plough Monday celebrations, and we were joined for part of the day by the lovely Unthank Sisters, Rachel and Becky, and their film crew. The girls were putting together segments for their second film 'A very English Winter', which continues their journey into Englands' customs and dance traditions and winter celebrations. They filmed us dancing outside the pub, just as the light was fading, and interviewed Andrew and Jason our Broom Dance officionados. The rest of us sat at the pub benches not looking to camera, and muttering 'rhubarb, rhubarb', while Jason and Andrew taught the girls how to do the Broom Dance. It was all great fun, they even roped the crew members in! Now given the very nature of filming, we don't know how much of the film shot ended up on the cutting room floor - although that is a redundant term nowadays - but I'm sure the film will be both entertaining and informative. You can watch or record it on BBC4 Sunday 16th December at 9pm. Will look out for the programme, I'm wondering if they're the group my son was talking about, when he said there is a group who all dress differently,and are known for it. Ouse Washes used to wear very bright, colourful rags and tatters and stripey tights, and black faces. Then Gog-Magogs (Cambridgeshire) came into being and did a similar costume but I THINK with green faces (not sure about this) so Ouse Washes have in the last year or so, tried to subtly change ours as everyone was starting to have the same look. Now we do a kind of Goth Wedding Guest vibe! Cocktails dresses in clashing colours, still some stripey tight and of course the black faces. I actually preferred our original look, but the consensus was that too many newer groups were taking on the 'look' and we wanted to keep it a bit different. 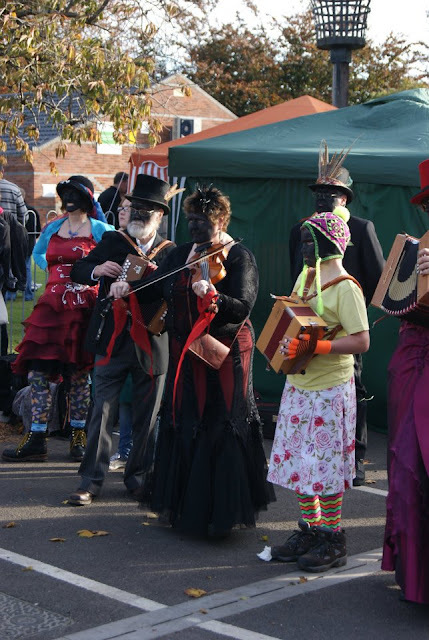 Ada, the term is Molly Dancing, as opposed to Morris Dancing. They have similarities, but obviously great differences too! Men and women take part, lots of cross-dressing! There is a Molly, the 'fool' role and general spokes-person. Many dancers take part in both traditions, Nick, my music tutor is one such, and he also plays the music too! If you google Ouse Washes Molly Dancers you'll find our website and it gives the history and other fascinating info! Famous Actress? ho ho! If you blink you'll miss me! No, it was the dancers they were mainly interested in, and learning the Broom Dance. But you may catch me in my finery aongside Spiers and Boden in April! Watch this space!! I bought mine, Cathy - I'm no dress-maker! But some of the other girls make their own - or adapt one's they've bought; some of them are very talented.